e-Series is able to complement production regardless of your industry, company size or product nature. Built with the future in mind, the e-Series is designed to grow in capability alongside your business, taking on new tasks and finding new uses so you will always be able to stay ahead of your competitors. The e-Series takes robotic automation beyond what you can do today. Get ready to trail blaze into the future. Explore the possibilities of robotic deployment with Universal Robots. Our cobots are lightweight, space saving and easy to redeploy to multiple applications without changing production layouts. They can be moved between tasks quickly and are able to reuse programs for recurrent tasks, giving customers the flexibility to automate multiple manual tasks within one production facility even with just one cobot. The e-Series’ versatility is supported by the Universal Robots+ ecosystem, which offers a range of end effectors and software to meet every configuration and application need. Forget programming school. With Universal Robots, anyone can become a robot programmer. Save on the costs of a professional programmer with Universal Robots. Our patented and highly intuitive 3D-interface allows anyone within the production facility to become a robot programmer even without prior experience. A user friendly and highly intuitive teach pendant allows operators to program a cobot by moving its arms to the desired waypoints, or simply using drag-and-drop functions on a touchscreen tablet. Even the most complex tasks can be taught to our cobot with Universal Robots’ integrated Force Torque Sensor. Highly sensitive to even the slightest movements, the sensor enables our cobots to be programmed with precision for tasks where accuracy is of paramount importance. 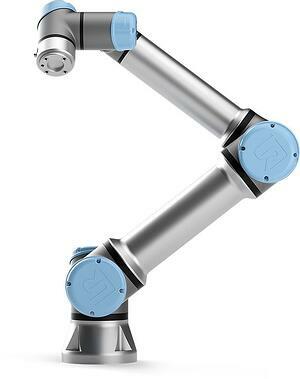 Reduce robot deployment time from weeks to hours with Universal Robots. Our cobots are equipped with single phase A/C power source compatibility and an intuitive user interface for easy set up installation and integration into your production line. Changing your cobot’s task is a seamless affair as well. 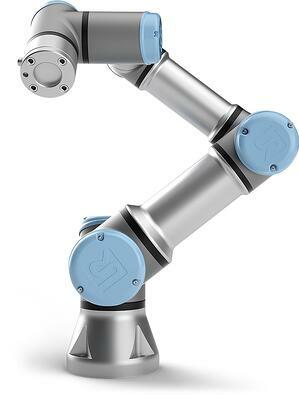 Wrist tool I/O connectors and a high speed communication bus enable hassle free integration with Universal Robots+ products to maximise productivity so you will always be ready to plug and produce. Universal Robots brings all the advantages of advanced robotic automation and collaborative robots to our customers without any of the traditional added costs associated with robot programming, set-up and safety guarding. Universal Robots makes robotic automation an option for small and medium enterprises, small batch production runs and other setups where traditional solutions may be too expensive. Firefighting equipment manufacturer Task Force Tips is an example of one of such enterprise, where the safety guarding and inflexibility associated with traditional robotic solutions hindered the effectiveness of automation. With the addition of 4 Universal Robots cobots to tend their CNC machines, however, Task Force Tips was able to reduce staffing requirements while raising productive hours, registering Universal Robots’ fastest recorded payback of 34 days. Built with the needs of these businesses in mind, the e-Series’ boasts a fully upgradeable software platform that can grow in capabilities to make it a lasting and worthy long-term investment. Our cobots are able to take over strenuous tasks in dangerous or dull environments and minimize exposure to dangerous chemicals or gases in the production process. With our patented safety features, you can fuse the best of human ingenuity with robot competency for accelerated productivity and growth. Safety mechanisms like customizable stopping times and collision detection capabilities in our cobots ensure safety when cobots work hand-in-hand with operators. The e-Series family has 3 members – the UR3e, UR5e and UR10e. 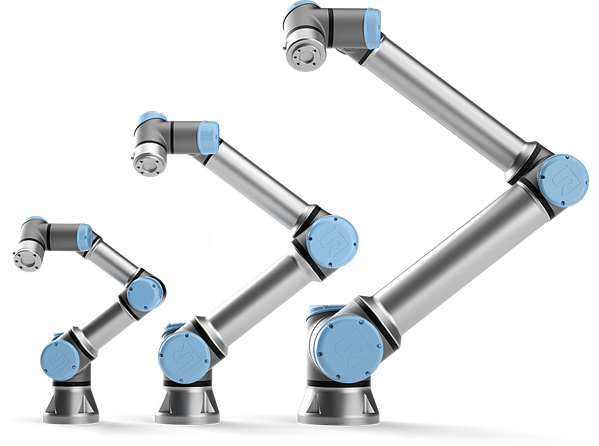 Each cobot has a different reach and payload, but they share the same precision, accuracy and dependability that make them a valuable addition to any production facility. Small but powerful, the UR3e has a payload of 3kgs and reach radius of 500mm. 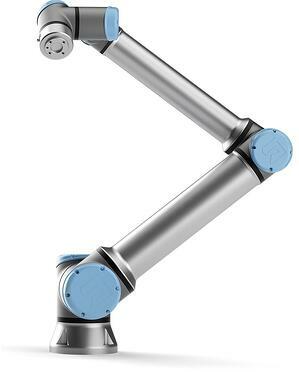 With 360 degree rotation on all wrist joints and infinite rotation on the end joint, this table- top cobot handles high precision tasks and light assembly tasks with ease. The medium-sized member of the Universal Robots family is ideal for automating low-weight processing tasks with its 5kgs payload and 850mm reach radius. Easy to program and fast to set up, the UR5e strikes the perfect balance between size and power. With the ability to automate tasks up to 10kgs with no compromise on precision, the UR10e is the Universal Robots’ family’s most powerful robot. A reach radius of 1300mm also enables it to carry out tasks like packaging and palletizing in facilities where there is a larger distance between different operating areas.